The battle for Latakia has demonstrated the unique dynamics of the coastal area for combat between the rebel and regime forces. Unlike other areas, where regime forces have been forced to redeploy to deal with rebel incursions, in Latakia the regime was able to rely on air power and local paramilitary forces to effectively isolate and reverse the offensive. On August 4, 2013 rebel groups launched “Operation Liberation of the Coast,” an offensive into Latakia’s northern mountain range from the village of Salma. Initial attacks by some 2,000 opposition members claim to have captured as many as 12 villages in the Jebel al-Akrad area of northern Latakia. This rebel offensive, which was spearheaded by local groups namely, Harakat Sham al-Islam, Suqor al-Azaz, Ahrar al-Sham, Dawla al-Islam, and Liwa al-Mujahideen, in conjunction with Jabhat al-Nusra (JN) and Islamic State of Iraq and al-Sham (ISIS) simultaneously illustrates the growing strength and capacity of Salafi and Salafi-jihadist groups and the narrowing political space in which secular opposition groups are able to operate. Throughout Syria’s civil war, Latakia has remained largely untouched by violent clashes. When the Syrian uprising began in 2011, Assad conducted clearing operations in Sunni coastal enclaves, namely Latakia’s Rama neighborhood there by displacing Sunni residents consolidating an Alawite stronghold on the coast. Despite a lack of permanent regime troops on the coast, the regime has been able to maintain this control through a reliable security apparatus, paramilitary forces, and a predominantly Alawite and Christian population that relies on the regime for protection. Low levels of violence in Latakia, however, have caused an influx of over 70,000 IDPs, leading to an increase in the Sunni population on the coast. The FSA has also maintained a presence in Salma since the summer of 2012 and Latakia’s northern tip has been a stronghold of several local extremist groups for almost a year. On August 4, 2013 rebels captured eleven villages in the Jebel al-Akrad region reaching as far as the village of Aramo and approximately 20km (12m) from Assad’s ancestral village of Qardaha. Following the initial attack, various rebel groups released videos and pictures claiming the capture of a series of villages and both JN and the ISIS released statements claiming areas of control. Within two days regime forces launched counteroffensives and claimed to recapture a number of these villages. On August 18th, the regime made a major advance and claimed to have retaken all rebel positions in northern Latakia. The contested villages are: Aramo, Abu Makkah, Al Hambushiyeh, Ballata, Balluta, Baruda, Beit Shakohi, Barmase, Domzine, Isterba, Kefraya, Nabateh, Obin, Talla. These competing claims outline a conflict zone that ranges from Salma – the original launch point of the operation – to Aramo, just north of regime controlled villages Haffa and Slanfeh. 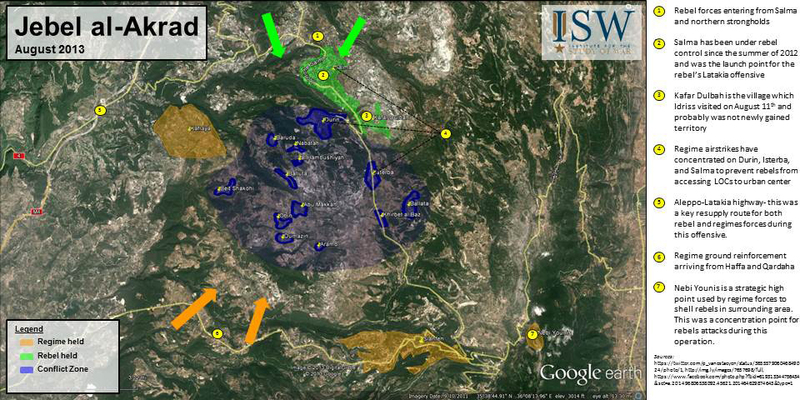 Unlike the urban coast, Latakia’s current conflict zone is extremely mountainous and rugged terrain. The rebel offensive occurred through close coordination between small local groups with comprehensive knowledge of the terrain, namely Suqor al-Azaz, Liwa al-Mujahideen, and Kataib Ansar al-Sham, with larger, wider-reaching groups such as JN and ISIS with the necessary tactical knowledge and resources. During the first phase of the offensive, the overwhelming seizure of villages by rebel forces demonstrates success in leveraging this terrain knowledge to their advantage. While rebels were initially able to use terrain to their advantage, the regime’s advance on August 18th demonstrates its ability to successfully leverage its air power and rely on local paramilitary support without massive troop redeployment. In Latakia, the regime’s strategy has sought to confine rebel forces to isolated villages, thereby blocking off access to the urban center; on August 13th, for example, the regime concentrated aerial bombing on the villages of Isterba, Durin, and Salma, all of which lie directly on the route to Latakia’s coast. Unlike recent battles in al Qusayr and Aleppo, there has been no significant redeployment of regime troops from other fronts to Latakia. This is because the regime been able to depended primarily on the mobilization of local paramilitary forces to carry out its ground offensive. Some analysts have suggested that putting pressure on Latakia will force the regime to defend its stronghold thereby relieving pressure on other fronts such as Homs. This distinguishes the Latakia battlespace from others in Syria; unlike the regime’s attempted push into Aleppo in July, control of Latakia does not require massive force redeployment because the population of loyal paramilitary fighters already exists. The regime’s ability to isolate the rebel-led offensive through airstrikes and mobilized local paramilitary forces for ground engagements makes attempting to distract regime forces in Latakia an ineffective proposition. Despite an apparent military defeat, initial rebel success in Latakia does, however, reflect the increasing capacity and strength of Salafi and Salafi-jihadist groups in Syria relative to secular opposition groups. ISIS and JN have not only been at the forefront of two high-profile offensives this month but, particularly in Latakia, have also demonstrated the ability to coordinate effectively with groups at the local level. The prevalence of these groups in Latakia began with the assassination of FSA commander Kamal Hamami in July, which instigated an important shift in the balance of power among rebel groups in northern Latakia. Hamami was the most important FSA commander on the northern coastal front and had been organizing operations in northern Latakia for over a year. Following his death, ISIS and JN in particular have been able to fill this leadership vacuum and increase their operational influence in the area. Furthermore, Ahrar al-Sham, which had previously operated in the coastal areas south of Hamami’s control has expanded their operational zone and has played a prominent role in Latakia. This dynamic is further underscored by tensions between ground commanders and the FSA leadership with respect to the Latakia offensive. On August 10th the FSA was forced to deny allegations that its battalions would be withdrawing from Latakia in response to rumors that the FSA leadership ordered ground troops to stop fighting. Though this order cannot be verified, in an interview with Al-Jazeera TV FSA Col. Mustafa Hashim said that the western front had been starved of arms by “backer countries.” Additionally, one source reported a senior FSA commander saying that the United States opposed targeting Latakia due to the possible blowback of increased sectarian violence. ISIS and JN rhetoric in this campaign has had a highly sectarian tone, and the contested area is predominately Alawite. Subsequently, FSA leader General Salim Idriss visited Kafar Dulbah in Latakia on August 11thand issued a statement saying that the FSA was in Latakia to fight against regime troops and not Alawite civilians. These conflicting narratives over the FSA’s participation in the Latakia offensive reveal a legitimacy challenge for the moderate opposition. While the FSA’s participation in “Operation Liberation of the Coast” is essential for the support of its revolutionary base, in order to maintain military significance and access to weapons the FSA must also appease its foreign supporters who want to contain sectarianism. This disconnect between FSA leadership and ground forces followed by a concerted effort by the leadership to distance themselves from the sectarian connotations of the Latakia offensive illustrates the narrowing space in which the FSA is able to operate. Lauren Williams, “Latakia Offensive Inflames Syria’s Sectarian Wounds,” Daily Star, August 7, 2013. Elizabeth O’Bagy, “Syria Update: Assad Targets Sunni Along Syria’s Coast,” Institute for the Study of War, May 10, 2013. “Region Analysis Syria,” Relief Web, July 31, 2013. Joseph Holliday, “The Assad Regime from Counterinsurgency to Civil War,” Institute for the Study of War, March 2013; Lister, “Decoder: Battle for Latakia Begins,” Syria Deeply, August 5, 2013. Dominica Evans, “Assad's forces push back rebels in Syria's Alawite mountains,” Reuters, August 19, 2013. Translation of ISIS Statement “Statement about operations of ‘Purification of the Coast’ in the Wilayah of Lattakia,” from jihadology.net; “Al-Nusra Front Reports on Ongoing Battles in Latakia to "Liberate" Villages,” SITE Monitoring Service, August 9, 2013, http://news.siteintelgroup.com; August 7, 2013;“The Army restores security to three more areas in Latakia northern countryside,” Syrian Arab News Agency, August 12, 2013; Haytham Mouzahem, “Syrian Rebel Forces Set Sights on Latakia,” Al-Monitor, August 7, 2013. Lister, “Decoder: Battle for Latakia Begins,” Syria Deeply, August 5, 2013. See F. Najia’s blog “Some FSA and SNC Leaders equivocating,” August 10, 2013. http://arabsaga.blogspot.com/2013/08/some-fsa-and-snc-leaders-equivocating.html. Elizabeth O’Bagy, “Syria Update: Syrian Army Renews Homs Offensive,” Insitute for the Study of War, July 5, 2013. “Syria: FSA Denies Withdrawal from Latakia,” Aawsat News, August 10, 2013. “Syrian Rebel Military Chief Visits Assad Heartland,” Daily Star, August 12, 2013.